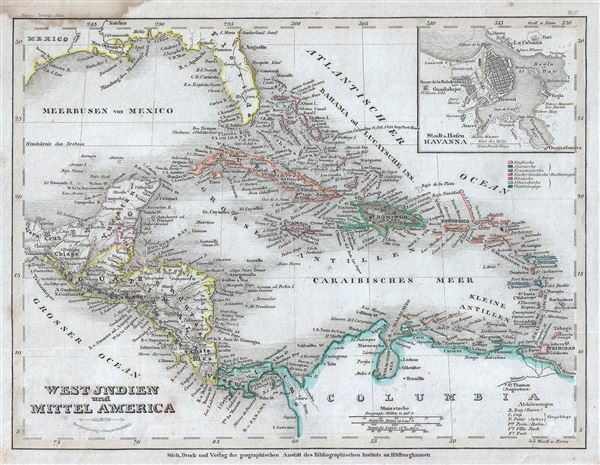 This is a beautiful 1852 map of the West Indies and Central America by Joseph Meyer. Centered on Haiti or San Domingo (Hispaniola), the map covers the Caribbean from Florida to Venezuela and from Yucatan to the Lesser Antilles. It includes the Bahamas, Cuba, Jamaica, Haiti and San Domingo (Hispaniola), Porto Rico, the Virgin Islands, the Leeward and Windward Islands and Trinidad and Tobago. It also shows parts of Guatemala, Venezuela, New Granada and the Isthmus of Panama. An inset in the top right quadrant detail the City and Harbor of Havana. The map identifies the island of San Salvador or Cat Island in the Bahamas as the site where Columbus supposedly landed on October 12 of 1492. Meyer also notes such undersea features as the Florida Reef, Pedro Bank and the Great Bahama Bank. This map was issued as plate no. 57 in Meyer's Zeitung Atlas. Although all the maps in this atlas are not individually dated, the title page and maps were often updated while the imprint with the date was not, causing confusion to the exact date for some of the maps. Moreover some maps in the atlas were taped in at a later date as an update to the atlas. We have dated the maps in this collection to the best of our ability. Very good. Large damp stain over top left margin. Minor spotting at places. Blank on verso.